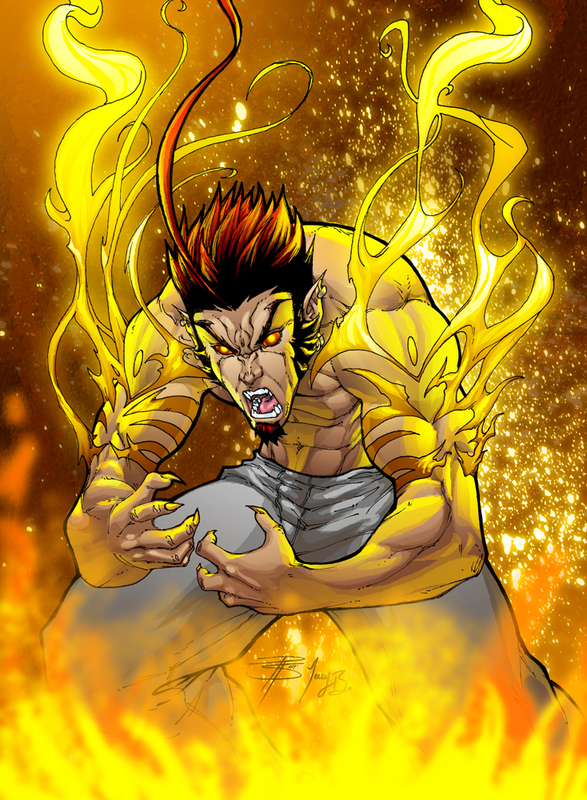 Nickname: Foo, Foo 2 da Ray, FooDiggy, FlareII, jr.
Fooray's father was a world class hero where he's from, sort of a "super hero type" a fire weilder with inhanced strength. . foo also retains that ability from his father as well as a black flame ability passed down from his fathers blood line that his father never obtained. 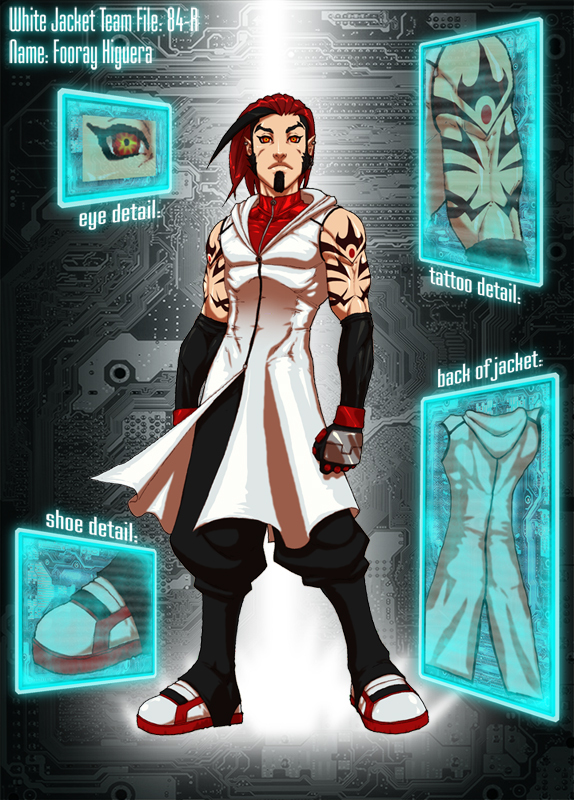 the black flame energy is held in his body and focus in two red markings on foos arms at the shoulder. His mother was a more rare species a sort of vampiric type. she was a villain in the town foo was born in but converted to be with foorays father. . .she was killed off by her old villain allies when foo was very young. he gained from her the ability to fly as well as her physical traits of claws and fangs. fooray is the middle child of 3. . .has a younger brother named Toni. . .and an older sister named Sierra. . .Fooray was named by his mother while the others were named by his father. foo was always the runt as a child and due to that got very little attention from his father especially after his mother was murdered. foorays father was more interested in training new heroes and warriors than raising his children just because they were his kids. After reading an artical in "Fighters Insider" and hearing about fighters going missing in Void City he couldnt think of a better place to start his journey. . .
-When first arriving had a brief sparring match with "Sol", putting him out of commission there after. -Brawled with a goon named "Stud" shortly and gained a friend in "Sushi".. after saving her he went to the mountains to train more. -started working at a pizza shop in down town Void city with Asian bloke and Syke. After leaving work one night he meets a strange injured woman turning out to be Ajay Godwin, he takes her in for the night and patches her up. -Encountered "Mize" and was asked to try out for recruitment by fighting "P2" at a private location. -Became an active member of the white jackets. -Starts hanging out with Ajay more often. is definitely interested in her but she remains a mystery to him. -Met and befriended "Angela Rudell" through "P2", Then shortly after becoming aware of her short lived pregnancy. -Visited by "Familiar" Figures from his past in an on going new conflict.